← QUAERITUR: Guidelines for “environment” for the liturgy coordinator. Fr. Z rants. It is time for a LONDON BLOGNIC! 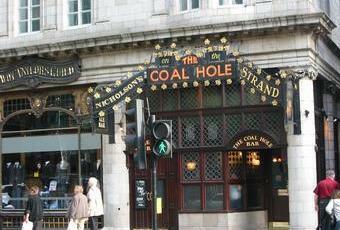 We are going to meet at The Coal Hole on The Strand near the Savoy. There is Holy Mass at Corpus Christi on Maiden Lane at 6:30 pm (Extraordinary Form). We will go straight over to the Coal Hole after Mass. So, 7:30 is approximate. You get the idea. I figure we will be there for a couple hours, at least. It will be nice to be in (or at least near) the Liberties of the Savoy! The tipstaves won’t be able to haul us off to the sponging house. As long-time readers know, “blognic” is a blend of “blog and picnic”. A blognic is a social appointment intended get people together to talk and have a drink or some food. Not much more than that! It is meant to be fun and bring together face to face people who participate on this blog. Sometimes when I travel people ask if they can meet me. This is a way to do that. I can’t be there, but a good choice, Father; I’ve had some decent pints in the Coal Hole. I don’t know what the food’s like (the pubco that owns it, Nicholsons, usually does plain pub grub in a competent manner), but there’s usually an interesting range of ales. If anyone is trying to follow it, note that the map is oddly oriented, having North towards the bottom left corner. Of course most of the roads have changed due to redevelopment, but if you take a line on Southampton Street, which still exists on the other side of the Strand, it looks like the un-named road on the 1830 map, in between Beaufort Buildings and Cecil Street (neither of which exists under that name today) is the present Carting Lane. The Coal Hole is on the eastern corner of Carting Lane and the Strand, which seems to put it firmly in the Savoy. I am so glad! We will be safe and snug in the snug… or in the basement. It seems as if we might have a good crowd! And Os iusti for an Abbot. This entry was posted in Blognics, O'Brian Tags, On the road and tagged blognic, Coal Hole, Liberties of the Savoy, London, The Strand. Bookmark the permalink. You see, Father, you can run but you can’t hide! Just joshing ya! B U S T E D !!! I suggest at the Porterhouse at 21 Maiden lane? I have not been there in a couple of years, but as I recall it’s a big venue, and shouldn’t be too crowded on a Monday night. Welcome to England Father Z! Monday would be a good day for me as suggested after the evening Mass at Corpus Christi. Corpus Christi on Maiden Lane is just down the street from King’s College London; when I was studying there, I went to the church quite often during the week (especially to say the rosary during exam season…). It’s where I first went to the TLM. I’d like to say that was a great experience, but I spent most of my time completely bewildered, thumbing through a missalette. But it was still my first. Hope you enjoy your time in London, Father. Would I could be there ! “Domine, dirige nos.”- I daresay that’ll hold beyond the square mile, blognic where you may! This may be a stupid question, but… what happens at a blognic? Ezra: Not at all a stupid question. People get together and talk and have a drink or some food. Not much more than that! It is meant to be fun and bring together face to face people who participate on this blog. I’ll add something about this to the top entry too. I’ll do my best to be there. I have heard that The Coal Hole does have good food. I took a look at the menu and noticed that the pies have potential. WaywardSailor: Which I also noted that deficiency in the map. The menu prices are extremely reasonable for London. Sadly, I shall not be there. Have a great time, Father Z and all! What is this Liberty of the Savoy . . .??? I’ve travelled from my northern fastness . .been to Corpus Cristi . . had a quick pint in the Cole Hole . .now who or what should I be taking liberties with . . .!!! sounds a rum do if you dont mind me saying . . .I think I’ll carry on as normal . .eh, cant be making a fool of ones self . . .and the blog nick not even started . . .once I’ve had a few pints . . .thats the time to make a fool of ones self . . .IMHO . . .as they say . .!!! Wish I could be there! Alas, I can’t….passport’s long expired, and I’m cash-poor. Too bad I’m unable to bilocate….! Anyhow-have a grand time in Old Blighty, Father Z….sure wish you could do a blognic in Upstate NY! Oooo, those meat pies sound good! This of course is another Patrick O’Brian Aubrey / Maturin reference, Capt. Aubrey owed a considerable amount to debtors and could avoid being captured if he stayed in the Savoy area, where the “tipstaves” had no authority. Like the Liber Pro screen shots, Fr. :) Great app, isn’t it? There are a handful of guys in our men’s schola who use it all the time to sing the propers for Mass. The Liberty (or Precinct) of the Savoy was a small area of London that was legally part of Lancashire. These county “exclaves” were very common, affecting things like pub licences, until the Victorians tidied them away. But Lancashire was different, because Lancashire was (like Durham) a County Palatine, i.e. it had a great deal of independence – including having its own courts. So in many cases, a legal action started in the normal English courts wasn’t valid in Lancashire – and because the Savoy was legally part of Lancashire, despite physically being in London, it was effectively outside the jurisdiction of the London courts for some matters, including debt claims. You could presumably have gone to the Lancaster courts to get an order, and persuade their tipstaff to come down to the Savoy to enforce it, but given the state of the roads at the time that was impractical. Most of the area of the Savoy (although not the Hotel) is still owned by the Duchy of Lancaster, but sadly the legal significance is now gone. But as a Lancastrian I do like to puzzle Londoners by welcoming them to my county when in the Coal Hole. And I wish I had been able to be there tonight!